The seventh edition of this classic reference book adds new countries and regions, updated prices, new styles of popular wines and updated information on the latest vintage years. Written by wine authorities Ed McCarthy, a well-known Certified Wine Educator and Mary Ewing-Mulligan, a Master of Wine, the first edition of this easy-to-use book appeared in 1995 and has been revered for its straight talk about wine. This is not a book to read from start to finish, but rather one that can be referenced as needed on specific subjects. The information contained is very basic and is most suitable for those developing an early interest in wine and want to learn more. 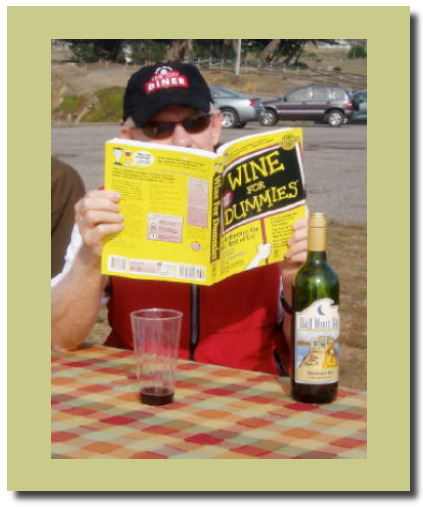 There was a time in my wine knowledge infancy when I had a copy of Wine for Dummies on hand (see photo above taken many years ago). Although the book was recently published, it suffers from a malady suffered by many similar books in that it is not completely up to date when finally published. For example in the discussion of American Viticultural Areas, there is no mention of the now-approved Petaluma Gap AVA and the impending True (West) Sonoma Coast AVA. The soft-cover book is sold for $24.99 ($19.74 at Amazon) and the Kindle edition is $13.00. For a more comprehensive general book on wine (over 1,000 pages and more unwieldy) sold in paperback at the same price, consider the Wine Bible by Karen MacNeil.